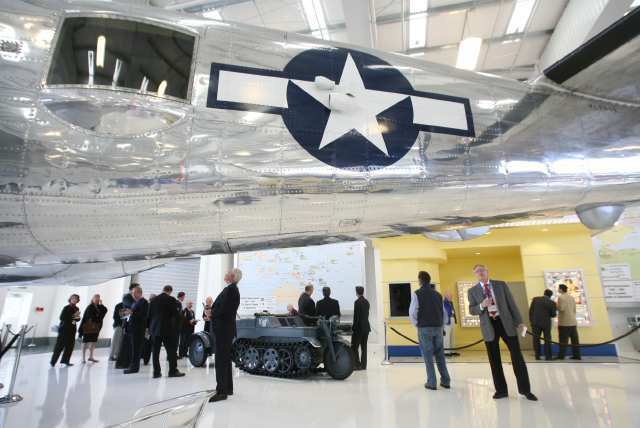 Costa Mesa, nicknamed City of the Arts, has gained another attraction in our neighbor city of Santa Ana – The Lyon Air Museum. The museum is next to the John Wayne Airport and displays aircraft and autos from the 1930s and 1940s. Major General William Lyon opened the museum as a way to teach people in his home area about the efforts of American servicemen during World War II. Military veterans will serve as docents and a lot of them even served during WWII. The 30,000 sq. ft. Orange County museum broke ground in 2007 and opened during a ribbon-cutting ceremony on Thursday, Dec. 10, 2009. Lyon Air Museum serves to educate the public about the “Greatest Generation of Aviation.” There are plenty of amazing features like a 1939 Mercedes-Benz Model G4 Offener Touring Wagon used by Adolph Hitler during World War II, as well as an authentic truck from Helms Bakery, which was used locally in the 1940s. One of the greatest missions of the museum is to provide services to local school districts so that our youth will have a chance to learn first-hand about WWII. Costa Mesa students and the surrounding communities are very fortunate to have so many fantastic resources at their disposal. Make sure to visit the Lyon Air Museum and take advantage of yet another wonderful treat near Costa Mesa. Veterans Day is celebrated every November to commemorate our country’s veterans. More than that it’s a day dedicated to world peace. In Costa Mesa local students had a chance to meet a very special veteran – Army staff sergeant Walter D. Ehlers, one of 21 living World War II recipients of the Medal of Honor. The Medal of Honor is the most prestigious U.S. military decoration that is awarded for valor and bravery in actions that go above and beyond the call of duty. On June 9-10, 1944 Ehlers served as the spearhead for an attack against the enemy defenders and assumed a huge risk as he exposed himself to deadly fire. Throughout the fight he remained a courageous and heroic leader. He single-handedly defeated a German gun unit and in spite of his wounds he rescued a fellow wounded soldier, bringing him to safety. As a leader Elder acted fearlessly; he will forever be an inspiration for all. Ehlers is a resident of Buena Park, a community that is about 20 miles northeast of Costa Mesa. Special guests and lessons such as this are a privilege for students in our community. As a local real estate company we are always happy to see when local schools provide special programs for the students as it encourages learning and offers unique opportunities for our children. This event at Mariners Christian School in Costa Mesa will surely impact the audience who was so fortunate to have met with Ehlers. For more info, read the article on Walter D. Ehlers on OCRegister.com. Our Costa Mesa real estate company wants to highlight a recent event presented by South Coast Plaza, which is one of the main attractions Costa Mesa has to offer. South Coast Plaza isn’t just a place to go for a wonderful shopping experience, it’s also a community advocate. On October 1, South Coast Plaza put on a luxury fashion show for the Harvesters 17th Annual Fashion Show and Luncheon at the Island Hotel in Newport Beach. The Harvesters ( http://www.feedoc.org) is a support group that raises money for the Second Harvest Food Bank of Orange County, which provides food to over 200,000 people in Orange County every month. Costa Mesa’s South Coast Plaza brought in clothing and designs from high-end fashion houses like Chanel, Gucci, Christian Dior, Fendi, and more. Over 300 guests attended the show and caught a glimpse of the latest fall/winter fashions. What’s so great about this event is that South Coast Plaza represented Costa Mesa and all of Orange County by contributing to a worthy cause. This event raised awareness about the local food bank and brought in needed funding. Selling real estate in Costa Mesa, we like to see the spirit of community alive and well and South Coast Plaza did a great job giving back. Thank you for that! Read more information about this South Coast Plaza fundraising event on OCRegister.com. Torelli Realty is thrilled to hear about the efforts of Share Our Selves (SOS, shareourselves.org), a nonprofit organization that gave out over 1500 backpacks stocked with school supplies to low-income families in the area. On Saturday, Aug. 29, hundreds of families lined up at the organization’s Westside Costa Mesa location and thousands of children went home prepared for the coming school year. Share Our Selves, you get a gold star! During a year when a lot of families are struggling to make ends meet financially, Share Our Selves provided a glimmer of hope. In addition to this event they’ve been busy helping low-income families with other financial, medical, and social services too. Thank you to the 40 or so volunteers who put in their time cramming backpacks full of school items. Not to be overlooked are the local businesses who donated to the cause – such as Hyundai, Hot Topic, Experian, United Healthcare, local churches and others. Due to your generosity Costa Mesa students and others throughout Orange County are starting the school year off right! We’re thankful that Share Our Selves is contributing to the wellness of Costa Mesa and Orange County as a whole. A+ to Share Our Selves, volunteers, and contributors to the event! To read about it yourself check out the article by Briana Bailey in The Daily Pilot.